It’s a sad thing when you purchase a particular bead/component for a jewelry design and end up not doing anything with it for nearly a year. Where does the time go?! What is so fantastic about the new pieces that I have posted is that they come directly from nature. That’s right. Picked right off the tree (okay, well, maybe the ground?). And what better way to celebrate the peak of the fall season than to be adorned by these lovelies. This crystal necklace and earrings are designed with real oak leaves set against the warmth of gold metal. Each leaf is unique and special, capturing a part of nature, resulting in a beautiful piece of wearable art. Sparkle amongst the autumn leaves wearing these real lacey oak leaves which have been hand-dipped and electroformed in 24 karat gold, accented with crystal copper Swarovski Crystals. Finished with gold leverback earwires. Leaf earrings measure 1-7/8" from the bottom of the earwire; oak leaf measures 1-1/2". An elegant handmade beaded necklace that is reminiscent of autumn acorns and oak. 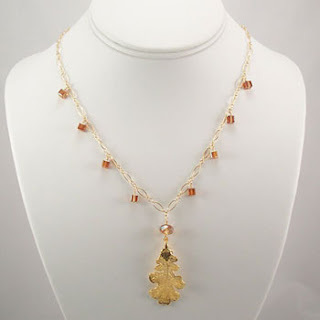 Accented with crystal copper Swarovski Crystals drops along a 14 karat long and short gold-fill cable style chain with a real oak leaf pendant which has been hand-dipped and electroformed in 24 karat gold. The overall necklace measures 17-3/4"; the leaf drop is 2" and the oak leaf measures 1-1/2" in length. Find both of these stunning fall leaf jewelry pieces under the fall beaded jewelry. So how’d they do that? The art of electroforming leaves - A real leaf is pressed flat and dried. Once dried, the leaf’s pulp is removed in a light acid bath, resulting in a fragile leaf skeleton. The leaf is dried once more and then hand painted with a copper based paint, which allows it to be electroformed. The leaf is next submerged in an electrolytic solution and with the magic of the positive/negative charges from electricity, over a 3 day period, metal deposits onto the copper based surface. If the leaf has fine veining then a filigree leaf will result. If a leaf has little veining then the electroformed surface will be solid. Prolong electroforming will also result in a more solid form. The final metallic leaf finish is dependent on the electrolytic solution used. Leaves should be cleaned carefully with a warm cloth and not with abrasives to maintain its longevity. Each leaf is unique and special, capturing a part of nature, resulting in a beautiful piece of wearable art. Newsletter subscribers -where are you?! Sadly, the September newsletter winner did not claim their prize of a lovely pair of earrings fashioned after purple grape bunches. That’s too bad, I love giving away beautiful jewelry. Well, this next contest comes at a perfect time. Just in time for holiday parties. 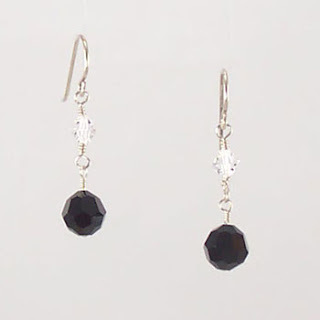 Our November newsletter subscriber prize is a pair of sterling silver and sparkling genuine Swarovski crystal earrings in black and white. What a fantastic accent to any upcoming holiday party. The winner is: claudia_dunn and she/he will have one week to claim their prize. I’ve posted a new gemstone necklace and earrings. A spectacular show of oval moss agate gemstones complemented by olive Swarovski Crystals and .925 sterling Bali beads lead the way to a wire wrapped moss agate gemstone drop pendant. The light and dark bands of color in each agate gemstone make this handmade beaded necklace truly unique. Gemstone necklace is adjustable 16-1/2" to 17- 1/2" with the drop pendant measuring 1-1/2". Each moss agate oval is uniquely different through a natural process that creates bands and patterns within the gemstone. Find this gemstone beaded necklace and more at Crystal Allure Creations. Moss Agate is a chalcedony (pronounced kal-sed-on-ee) that is formed in the sedimentary process whereby viscous silicic acid has been penetrated with iron silicate solutions without becoming mixed (essentially weathered volcanic rocks). This creates streaked moss green inclusions. It is a semi-precious gemstone, which despite its name does not contain organic matter. Moss agate is one of the more modest members of the crystal world. It lacks the glitter of lapis lazuli, the radiance of clear quartz, or the chatoyance of tiger’s eye. However, this multi shaded green variety of agate looks similar to moss when viewed from a distance and if you examine a moss agate closely (and especially if you hold it up to the light) you may discover a world within it. 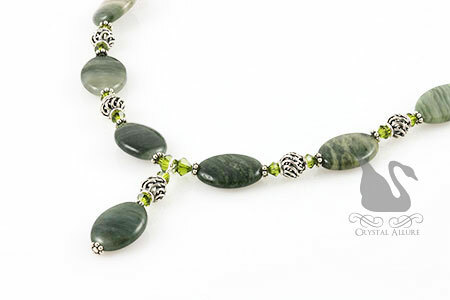 When used in jewelry moss agate is believed to bring the wearer health, friends and riches. The metaphysical properties of moss agate are primarily its strong connection with nature. Moss agate is a stabilizing stone that is said to refresh the soul and reveal the beauty of nature all around one. Healers use it to reduce sensitivity to weather as well as pollution in the environment. Midwives use moss agate to lesson pain during child birthing and to assure a good delivery. It is considered to be a stone of new beginnings and abundance. If you are looking for unique bridesmaids jewelry gifts for your autumn wedding, these leaf earrings would be the perfect complement. It may be possible to get multiple pairs of these earrings in a variety of the colors shown below or in one color, please contact me for availability. Frosting is a glass-finishing technique that renders a simple piece of glass as an exquisite piece of art. The Illustrated Glass Dictionary at glassonline.com defines frosting as follows: "The process of giving a glass surface a matte finish, thus reducing transparency. Frosting is done through a variety of methods. It may involve treating the glass by pouring hydrofluoric acid on it or exposing it to the acid’s fumes. Frosting also may be achieved by sandblasting, through a special glue application and subsequent removal, or by mechanical etching with a grinding wheel." Frosted finishes can vary greatly. Some have a coarse, sandpaper feel, while others have a soft feel and the look of clouded glass. The 19th-century term for glass with a frosted or matte finish was satin glass. Frosting or "satinizing" may be applied to opaque as well as transparent glass. In the handmade beaded earrings shown above, the shimmer of a genuine Swarovski Crystal was added to the design to purposely contrast to the frosted glass leaf bead. 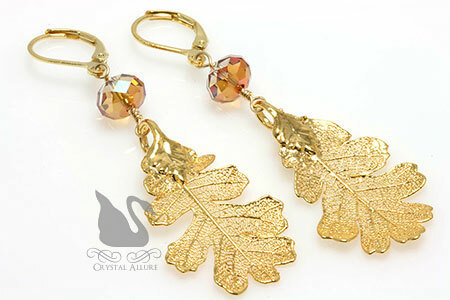 Please note: The Frosted Leaf Orange Topaz Crystal Earrings have been sold. A green frosted glass leaf, fresh with morning dew, is intertwined with 14kt goldfill and genuine khaki Swarovski Crystals making these handmade beaded earrings truly exquisite. Finished with 14kt goldfill hoop earwires. Length is 1-3/8" from the bottom of the earwire. A warm yellow frosted glass leaf, fresh with morning dew, is intertwined with 14kt goldfill and light topaz Swarovski Crystals making these handmade beaded earrings truly exquisite. Finished with 14kt goldfill hoop earwires. Length is 1-3/8" from the bottom of the earwire. Although it is now almost two weeks past, I still wanted to recap my show as the featured vendor at the local Ortho-Clinical Diagnostics (OCD/J&J) company during their annual United Way campaign. Let me first say, it was a “breath of fresh air” to be a featured vendor. I was completely blown away by the internal promotion of the event and in particular the work put into the visual advertisements for my show date. Someone took the time to create fantastic large signs that were posted on either side of the cafeteria. My ad was also featured as a split screen on two wall televisions, as well as, a full blown ad on a larger screen television. In addition, a company wide email was sent out indicating I would be there on this particular date. They had provided two great set-up locations to choose from on either side of the cafeteria, as well as, the tables and tablecloth. Everyone was extremely friendly and pleasant to talk with. At the later part of the day, one of the cafeteria employees even asked if I would like any water to drink. But, by far (for me) the best part was the fact that I was the only vendor for that day/time. After having done so many other shows, where there are likely three or more jewelry vendors for every other artist -it can get quite frustrating. Especially when your product really is very different than the rest, but it just doesn’t stand out because every third booth or so is the same category. So I do feel for the shoppers as well. I was thrilled to be able to talk about my jewelry, craft and specific design inspirations. I had some wonderful conversations and was very pleased to have met everyone that I did and appreciate their business and comments on my jewelry. In fact, I even learned something new -L.L. Bean has “bean dollars”! The system works much like other points systems, the more you buy the more “beans” you earn, valued in dollars. Too funny. The show was to run from approximately 11:00 until 1:30, but I never got out of there until almost 3:45. I even offered to customers to feel free to browse through the items I had already begun packing up, I didn’t mind at all. I love it when someone finds just the right piece of jewelry to add to their collection. The great part is, even if they only purchased a pair of earrings, they likely could still get a coordinating necklace or bracelet -as long as the components are still available. Many thanks to all the ladies AND gentleman who purchased an original piece of Crystal Allure Jewelry and thank you to Holly Korba for coordinating the event and including me this year. As well, a very special thank you to my husband for having brought my jewelry creations to the attention of Holly. I will be donating a portion of my sales to the United Way campaign and I very much look forward to participating next year. If you have an online website and/or store, the best thing you can do for your business (and sanity!) is to BACK UP, BACK UP, BACK UP -at least monthly. Regardless of any problems or issues you might have with your web hoster or their services, if you haven't backed up your site and something happens....and it is a possibility...you run the risk of losing your entire site and even your product pages. I know for most of us small business owners it can be tedious and difficult to wear the many hats that we do -but if you lose all the hard work you put into your online store -you have pretty much worked for nothing. And all us small business owners know how much time really goes into it all...more than most people would care to even think about. Although this issue came up with my store today -work was being done by the web hoster...and I hadn't backed up recently -I have learned my lesson. The shear worry (and fear!) of possibly losing all my hard work just infuriated me, frustrated me and much more. As soon as the site went up, I quickly did a back up. I don't think the hosting company is done with their updates so I cannot tell if there was any data loss -but I'm really, really hoping there wasn't! Although intuitively I knew to do back ups, I was so busy tweaking my store and wearing all the other hats that I do -that I just plain forgot. So, I have decided to set a monthly reminder in my online calendar to remind me monthly to back up my data. And I'm going to make a concerted effort to remember to back up my data when I do any major chunks of data changes. 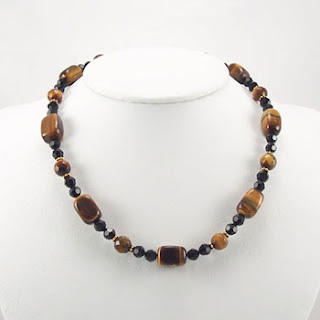 Tiger eye gemstone jewelry should be a staple in your fall jewelry wardrobe. Whether designed in handmade earrings or beaded necklaces the rich brown color and bold style are perfect complements to the changing color of the Autumn leaves. 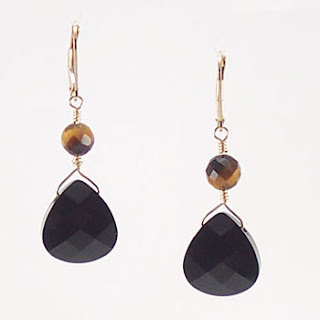 Tigers eye gemstone, if used properly in a design, can make for a versatile, everyday piece of jewelry. With swirls of black and brown and a hint of gold peeking out, here and there, these tiger eye gemstone pieces will be your favorite pick each morning! Don’t miss out on these fabulous one of a kind pieces! 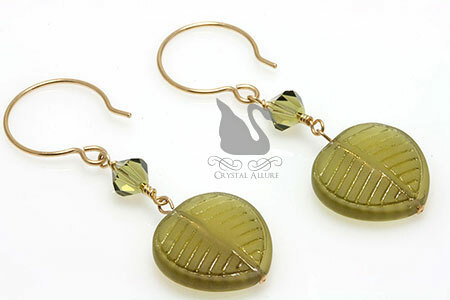 Find these wonderful Fall Jewelry pieces and more at Crystal Allure Creations! Sadly, I was notified the show to be held at the Lutheran Church of Our Saviour (LCOS) on October 13, 2007 has been cancelled due to a lack of vendors. The good news is you will still have an opportunity to pick up your favorite Crystal Allure Creations at the Union Hill show scheduled for October 20th. Network with me and Crystal Allure Creations handmade jewelry! I look forward to adding you as a friend! 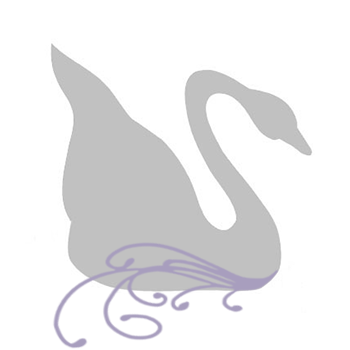 I am excited to announce Crystal Allure Creations is now listed with Grechens Closet. Here you will find a comprehensive list of shopping sites featuring independent designers and boutiques that you may not have heard of. What is SRAJD? It is the International Organization for the Self-Representing Artist Jewelry Designer. It might sound like a mouth full but when you purchase from an SRAJD member, you are buying directly from and supporting the artist. 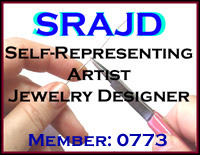 An SRAJD member sells the jewelry that they designed and created -nothing is mass produced. When purchasing your jewelry this is an important designation because it speaks volumes about the artists' quality of work, craftmanship and dedication to their craft. As a consumer, I am much more inclined to purchase from someone who has created their work of art, sells it and stands behind it. You will see this logo proudly displayed on our redesigned website, very soon! Crystal Allure Goes to the Prom! As promised a few months back, here are pictures of the jewelry pieces I designed for two local girls going to the prom. I was honored to have been selected to design these girls' prom jewelry. Although their prom was this past Friday and Saturday, they will be able to enjoy their sparkling Swarovski crystal jewelry for years to come! Every special occasion deserves special accessories! One girl requested a Swarovski crystal (clear) bracelet and earrings. I designed this set using a wire-wrapping technique for added elegance as well I added a wire wrapped swirl between the two crystals in the earrings. Absolutely stunning! The second girl requested a Swarovski crystal AB necklace with a drop. Again, I used a wire-wrapping technique for the entire necklace and wire wrapped a swirl to the delicate drop in the front. This necklace was so beautiful I had a hard time giving it up!! One word best described this necklace -Dazzling!!! Some days it just does not pay to get out of bed -today is one of those days. As if running around like a crazy woman to get on the road to work wasn't enough, I had to witness someone who hit a deer today. Our car barely missed that deer but not the car behind us. He wacked it with his front head light area and as I turned around in the car, I said to myself "don't do it", and sure enough I saw the deer fly into the air in circles only to land on the side of the road. As we drove and I tried to see how it was I noticed it was down (meaning it had been injured) and although its head was upright you could tell it wasn't going to be getting up. What made things worse is the guy who hit the deer didn't even stop. We have invaded their living space with all our houses and development and for gosh sakes if you hit an animal the least you can do is stop and evaluate its injuries. And in todays day and age, use your cell phone for crying out loud to call for help. Even if the poor thing cannot be saved, at least it would not have to suffer either. I don't know what happened to that deer today, BUT I did use my cell phone to call 911. I was not told that someone already called it in (which only made me more sad and angry) but I knew at least someone would go check him out. There was construction going on where the deer was hit and I hope those men at least went to check on the deer. Vote For Crystal Allure and YOU Could Win! 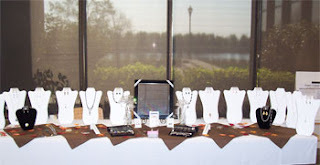 Put your vote in for Crystal Allure Creations Jewelry for StyleBakery.com's 3rd annual On The Rise awards and you could win a $500 shopping spree! Nearly half-way into 2007, it has proven to be an extremely busy year so far. Business has been progressing along at a very fast pace with orders, a whole new look for the website, new website features, wholesale requests and the like. With that said, I am very excited to announce Crystal Allure Creations is in collaboration with web designers to give us a whole new look! There are many, many changes coming down the pike. We do expect some minor bumps when the transition has been made, but for all the great changes coming it will be well worth it! Our new look will incorporate different colors, website structure and logo. What you see now will be no where near what you see later! Just some of the new features to be added include a wish list, gift certificates and coupon/discount options for VIP customers. There are also plans to allow visitors to make a purchase without creating an account. One of the things that I have struggled with since day one, has been photos of the jewelry and after many painstaking hours at research, testing and testing again, I do believe I have resolved this issue. You will start to see some better photos for the jewelry coming out now. I am even in the process of evolving the jewelry line and what you see available now might not be available once the new site is finished. So as you can see there are HUGE changes coming in the VERY NEAR future. I am excited beyond words and look forward to the challenges the come. Now....if I can only make this a full-time venture it sure would make life easier! Don't forget to check out the current designs, while they're still available! In celebration of springtime, all petite style earrings have been marked at either 50% or 60% off! 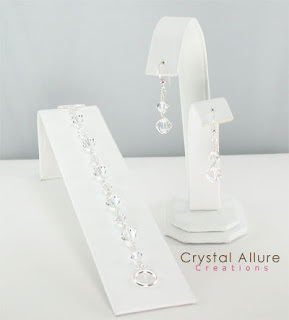 Most earrings are limited edition or limited in quantity -so you won't want to miss out on this chance to own a Crystal Allure Creations original. But hurry, the sale is for one week only and ends Easter Sunday (4/7/07). Pass It On!! It's So Easy! Over ten million animals are abused, neglected or abandoned yearly. You can help each day with a free click! Visit The Animal Rescue Site at http://www.theanimalrescuesite.com/ daily and click the purple "Fund Food for Animals" button. That simple action gives food to an abandoned or abused animal. There is no cost to you! Funding for nutritious food is paid by site sponsors and goes to nonprofit animal welfare organizations who use it to feed animals living in their shelters and sanctuaries. The Animal Rescue Site was launched in July of 2002 and has generated millions of bowls of food for rescued animals since then. With your help, many more animals will benefit in 2007! It all depends on the number of people who visit the site. Please click at The Animal Rescue Site once a day and forward this message on so more people can help give animals the happy, healthy lives they deserve. Together, we can make a difference for vulnerable pets and wildlife! Recently a woman emailed me to say she was not able to pull up my product pictures and was disappointed. My first reaction was that I was grateful she took the time to email me and bring this to my attention. In my response I explained that it might be a server "hiccup" and that she should try it again in a few hours. But if she was still unable to view them I'd certainly email her whatever I could. I emailed her the following day to ask if she had any success in pulling up the pictures and she replied that she did and was appreciative that I had followed up with her. She told me she appreciated the good business practice and that she would be forwarding my website link to some friends. BTW -if you read this Conni, Thank You for emailing me in the first place and mostly certainly for sharing my website with your friends! On another occasion a woman had placed an order and didn't realize until a few emails later that what she thought she would be getting was in fact, not what I would be shipping. She explained (and apologized) for the confusion and felt badly that she misread the website. My response to her was that it was not a problem, things happen and I sent her money back to her. She was grateful and also commented on my great business practices. And so there you have it. Customer Service 101 -it should never follow the old adage "the customer is always right" rather it should be your clear understanding that if you provide a service you DO have to make your customers #1 and WANT to make them #1. I have been on both sides of the fence and I am very proud of how I conduct business. Most retail stores cannot always provide this personalized service because they are so big. That is part of what I like so much about Crystal Allure. I am able to provide my customers and the public with jewelry they love AND I can tend to each and every customer who emails and/or places an order. These are my rewards!! Just something to think about the next time your looking to make a purchase online. But one thing is for sure -if you shop with Crystal Allure Creations you WILL get the best service AND high quality jewelry! With the website back up and running I am very happy to announce the HUGE Winter SALE! This is one you really won't want to miss. New designs have been added to this exclusive sale and with an endless choice of options, you're sure to find something. 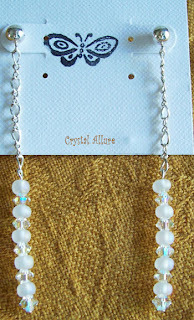 Across the board, this sale is featuring Crystal Allure Beaded Jewelry originals, with earrings for just $7.00! Necklaces for only $15.00 and bracelets for $18.00!! You'd have to be crazy to miss out on this fantastic sale -better still why not pick up a few things for gifts! BUT, (there's always a 'but') -you must hurry. This sale will end Friday, January 26, 2007 and the products will no longer be available via the website. Pay securely with PayPal or your credit card. You can even pay using a check or money order. I have been told that since yesterday my web hoster has had some DNS issues. What that means is, should you be attempting to pull up the Crystal Allure Creations website, you will not have any success. Due to these problems they are experiencing, they must reload all the configurations for their accounts and do not have an estimate of time as to when that will be completed. You may be able to intermittently pull up the CAC website, but for the most part, most pages will be inaccessible. As soon as this issue is resolved I will be sure to post that information here. With hope these issues will be rectified today so that I can post the "Winter Bonanza" sale that you really won't want to miss!!! 2007 Golden Globe Awards -Steal The Style! Personally, I think the best part of the whole show is the red carpet! What was I interested in -the fashions, of course! If you searched around the internet in the days following the awards you probably have noticed there was no shortage of 'fashion observations' -some say this person looked great, others say they didn't. Some said, these were the hot accessories -others disagreed. Whatever your observations or preferences, if you are interested in owning accessories similar to some of the more popular ones worn on the red carpet, you'll find them here at Crystal Allure Beaded Jewelry. Take for example, Kyra Sedgewick. She wore a pair of long gold mini-chandelier earrings. You can get this similar style wearing the Swarovski Blue Square Chandelier Earrings, which gives you a little color. Happy Shopping for your red carpet styles at Crystal Allure Beaded Jewelry. Are you more comfortable with using eBay? 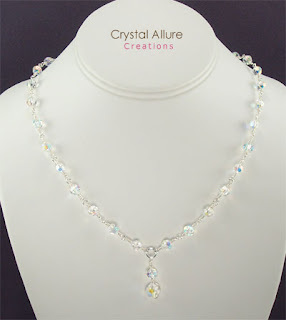 If so, you will now find Crystal Allure Creations has an active blog on eBay for your viewing pleasure. Although I do not have a store on eBay, I now have a blog. 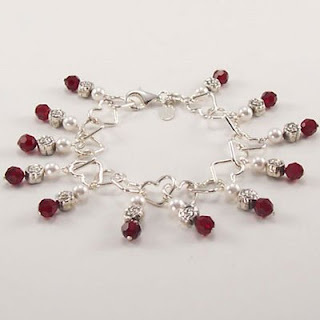 This bracelet is the perfect compliment to Valentine's Day! Now you can give the gift of both jewelry AND a dozen red roses!! Bracelet is a sterling silver heart link with lobster clasp, finished with genuine Swarovski pearls and crystal "charms". 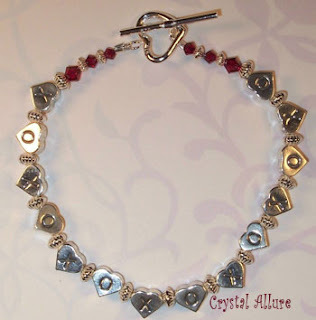 Purchase you own one-of-a-kind Dozen Red Roses Bracelet on the Crystal Allure Designs website. For a limi ted time save 20% and get yours for $12.00! These 2-1/2" long stunning earrings were made using genuine Swarovski AB crystals, frosted accent beads, sterling silver chain and post earrings. They are just the right touch for the most formal of outfits or to simply add a touch of glamour to a casual look. Winter is here -BBrrrr!! Why not warm up to the shimmer of Ice Crystals decorating your ears. These earrings were designed to mimic twinkling ice crystals, you know, the ones that form on your house as the snow melts and re-freezes. When light hits these earrings in just the right way, the shimmer it creates against the silver chain and crystals is what makes this design true to its name. Wear them to work, go home and change your outfit for a night out and you never have to change your earrings! That is what is so fabulous about Ice Crystals -you can take them from day to evening and from season to season. They are truly a staple to have in any jewelry wardrobe. In case anyone was confused, I wanted to post an explanation about why someone can still purchase products under the old product webpages. At the moment, the old product webpages are still sitting on the server. As a result, if you had saved a product page in the past as a favorite, when you select that link the old page will still come up. All the old "add to cart" features are also still in place. This was mainly a safeguard in case there were problems with the new online store. The intent was to delete those pages this weekend barring no purchasing problems with the new online store. Based on the fact that I have received some purchases from the old pages and also the new online store pages, I see it is working and will be deleting the old pages from the server this weekend. Have no fear, if you save a particular page you can still go to the new online store and do a keyword search that will return to you the exact product you were looking for. I hope this has helped to clear up any confusion and as always, I am here should you have difficulties checking out in the new online store. I get asked this ALOT. Being a jewelry designer, my friends and family are always curious if the pieces I'm wearing are ones I've made. My response? Yes and No. There are times when I wear exclusively my own designs; there are times when I wear jewelry given to me as a gift; and still there are times when I'll mix both: my designs with jewelry purchased for me/by me. Here's the logic: I'll buy something only if I feel or know I cannot find the component that makes the design so spectacular, to make it myself. Although, as a rule if I do buy a "fashion jewelry" piece from a store (which is really rare these days) I always make sure I have something from my Crystal Allure collection that I could wear with it. And without a doubt, if my husband buys me a jewelry gift (which is usually diamonds -because he knows how much I can't resist sparkle!!) I will most certainly wear those! So, yes, occasionally I'll still wear something that I did not design. I don't find the question offensive, actually I find it quite natural for people to ask that question. Over the years though, my personal jewelry collection has drastically grown with my own designs and also anything my husband would purchase for me..making the number of "fashion jewelry" pieces less-and-less in my collection. I thought I'd share my experiences since this question came back to mind last night as I filled my new jewelry armoire (that I received as a gift from my husband). My husband works with wood and had already made me a beautiful dresser sized armoire -however, with my love of jewelry and growing collecting of Crystal Allure originals -I ran out of space! So, I asked for a full size jewelry armoire for Christmas. As I filled it and organized the few remaining older fashion pieces that I had purchased from a store, I happened to think of this question that I've been asked frequently.